In a closely contested final of the Silver Division Foursomes Knockout competition, 4 players from Walmley GC played against 4 from Copt Heath GC, resulting in a win for Walmley. The venue for the final was Moor Hall Golf Club on Monday 22nd October and the sun shone throughout. How we are enjoying this autumnal golf!! 10.15 a.m. start with Walmley being represented by Pat YOUNG & Margaret RILEY and Copt Heath by Francoise BUDE (Fanfan) & Cheryl BUCK, who gave 3 shots to the Walmley pair. Interesting to note that Cheryl was only asked to step in at 7.30 this morning as one of the Copt Heath players had knee problems upon awakening. After 9 holes Copt Heath were 1 up and their good play continued throughout the Back 9, and finishing on the 18th, 3 up - things were looking good for Copt Heath at this stage. Second pairings saw Bev FIDDES & Pauline GIBBON representing Walmley against the Copt Heath pair of Liz MOVELEY & Karen DODSON and again 3 shots were being given to the Walmley pair. In this match Copt Heath had just drawn level after 8 holes but then went on to loose 10 and 11 and after 12 holes they were 2 down. Bev and Pauline did not let this winning streak end and gradually built up to a win of 5up after 18 holes. 1 match win each, but with the rules of the competition stating that scores from both matches had to be taken in to consideration, thus Walmley were the victors by 2 holes. Of all the Club Team colours throughout Warwickshire, these two Clubs both wore pale blue sweaters, making it somewhat difficult to see who was doing what on the course!! The matches though were played in excellent spirit with the eight players enjoying their morning in the late autumnal sunshine. 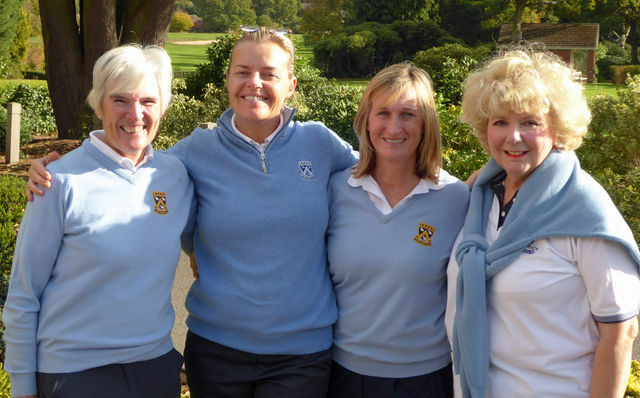 After play had finished the Walmley Team Captain, Pauline GIBBON commented that her team had thoroughly enjoyed playing in all of the matches, meeting some very nice, friendly ladies in the process of getting to the final and then the joy of winning today was just great. 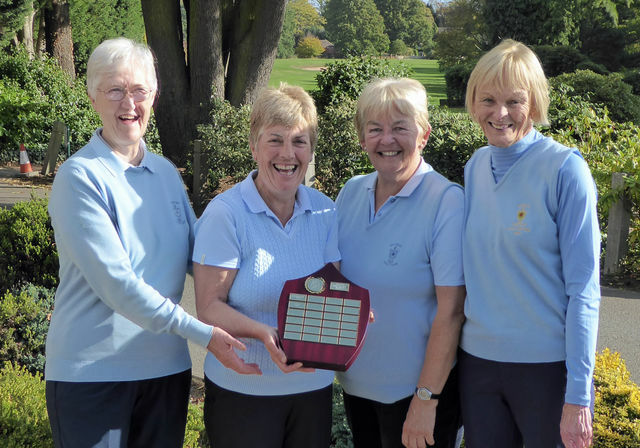 County President, Caroline LASSEN presented the Trophy and Prizes to the Walmley Team Captain Pauline GIBBON stating that everyone at Moor Hall today was a winner, just getting to the final! 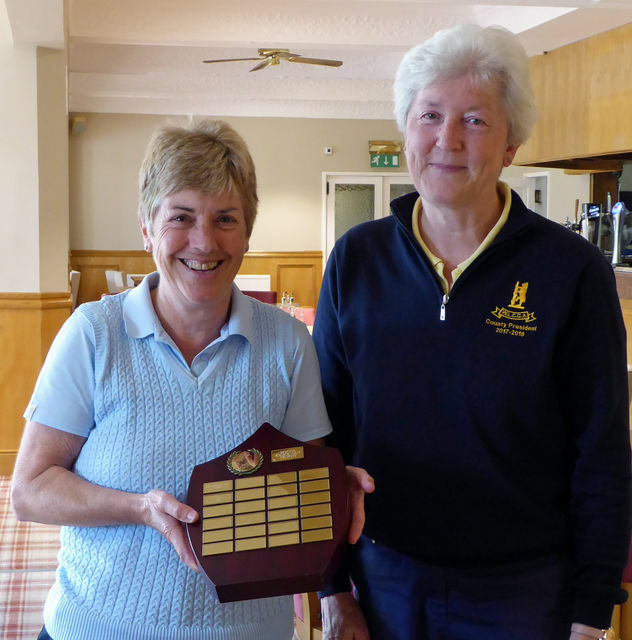 Caroline then went on to thank Karen DODSON for her efforts in running the 2018 Silver Division Foursomes Knockout competition throughout the summer months. The format of this competition is that Clubs from within Warwickshire, some 14 of them in 2018, applied to join earlier in the year and throughout the summer months played individual matches against other Clubs, culminating in the finalists playing today at Moor Hall. Each Club nominates a squad from which four players represent it in each knockout round with each pair playing in the Foursomes knockout format. Unlike most match play situations, these games all go to the 18th hole when the number of won holes for each combined pairing is matched against the opposing team, resulting in a final winning score. If however, the scores are the same, then the 2nd pairing carries on playing until a winner is found, which fortunately today was not required. All players agreed that this a great new addition (2016 commenced) to the County Inter Club scene, so Ladies' Sections in Warwickshire Clubs, why not enter this competition in 2019.